Over the past three decades, the growth rate in justifications for skyrocketing executive compensation has been nearly as high as the growth rate of executive compensation itself. Globalization makes a great CEO more valuable than ever. Tournament theory makes high pay inevitable. Companies are bigger these days. The skill sets of modern CEOs dwarf those of past eras. Pay is more closely linked to performance. Blah blah blah. two things: (a) stagnating worker pay has made a much bigger pool of money available for executive compensation, and (b) peer group comparisons inexorably ratchet up CEO pay. Because nobody wants to admit that their company is merely average, every company wants to pay its CEO more than average. But if every company wants to pay above the average, guess what happens? The chart on the right tells the familiar tale. Adjusted for inflation, cash compensation for line workers has actually decreased over the past few decades, and even when you include healthcare compensation it’s grown only about 30% or so. 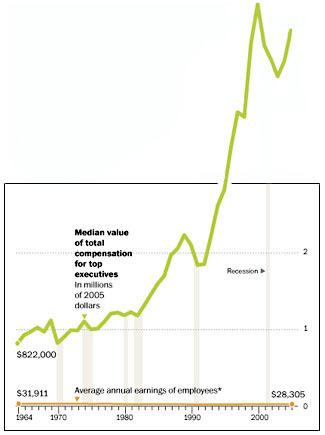 In contrast, executive compensation over the same period has more than quadrupled. Do they deserve this? Almost certainly not. There’s simply no good reason that a CEO of 2011 is worth 4x more than a CEO of 1970. The reason their pay has gone up is simple: for all practical purposes, CEOs set each other’s pay. And they keep raising each other’s pay because they can. It’s a pretty nice racket.